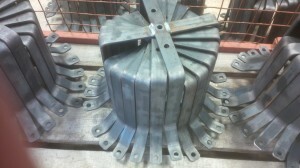 Mild steel bars used to produce exterior flood light mounting brackets. With fly presses, CNC bending and MiG welding these mounting brackets are ready to go off to hot dip galvanising. With 2 fully equipped welding bays and a variety of cleaning up equipment to sort out most jobs we can sort out your sheet metal fabrications from 0.7mm to 6mm thick. Whether it’s stainless steel, mild steel or aluminium we are happy to TiG or MiG weld fabrications. Great, Its cool. I aslo a big fan of *iG as well. Thank you for your comments on our MiG welded sheet metal work.